Hey everyone! 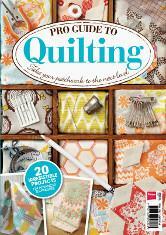 Are y'all ready to get quilt making? Hope so! I decided to go ahead and combine all of the directions into one post so that everyone can move at their own pace and take things as fast or slow as they would like. 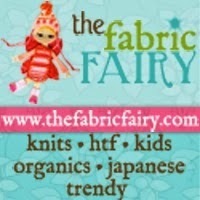 How was the fabric shopping? 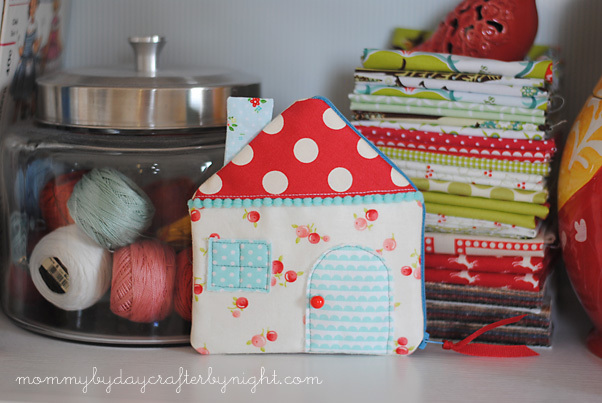 Did you get all of the supplies needed to make the quilt? Step 1: Cutting your fabric. 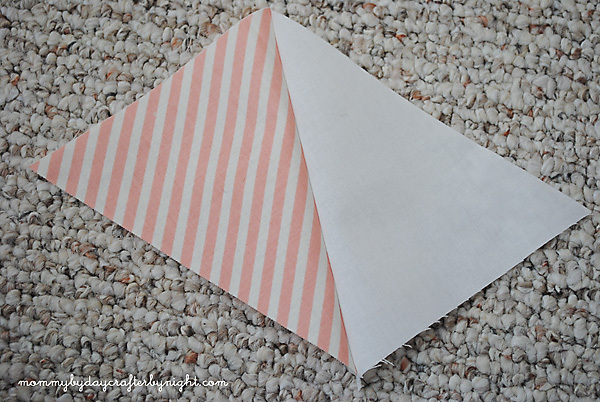 You will need to cut your fabric into strips that are 6" x WOF (width of fabric) so if you are using fat quarters you will have 3 strips that are 6"x22", if you are using half yards you will have 3 strips that are 6"x44", etc. Then you can start cutting the triangles. 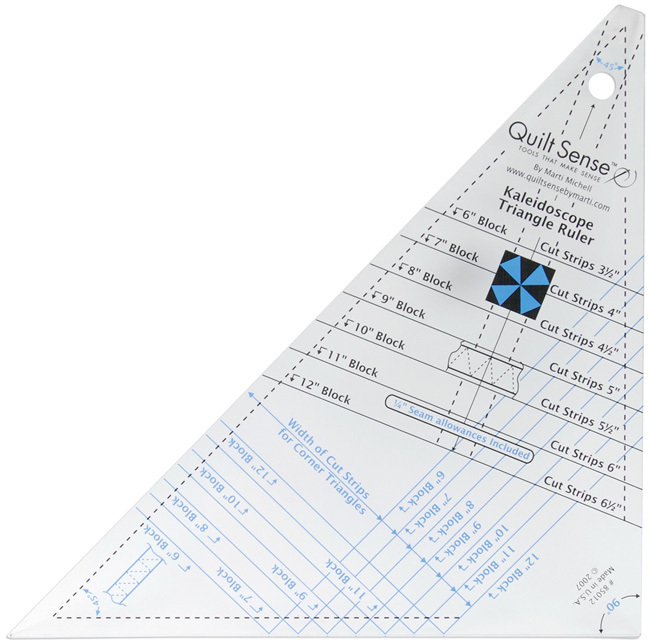 To cut your triangles, you will use your template (I used the Quilt Sense Kaleidoscope Triangle Ruler). 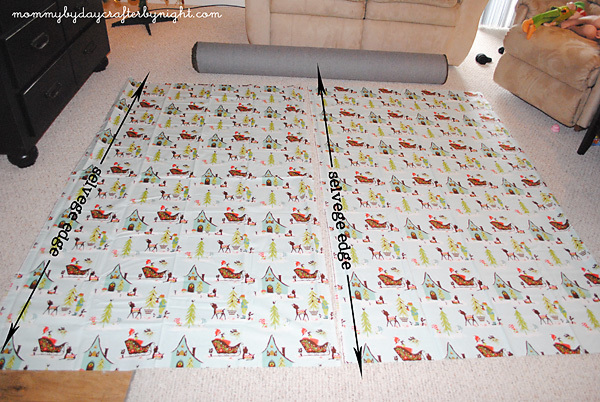 Line the ruler up on the 11" block mark and start cutting triangles by flipping the ruler up and then flipping it down across the fabric and cutting back and forth until you have all of your triangles cut- both your neutral and patterned triangles. If you are making your quilt identical to mine, you will need 156 neutral fabric triangles and 156 patterned fabric triangles. 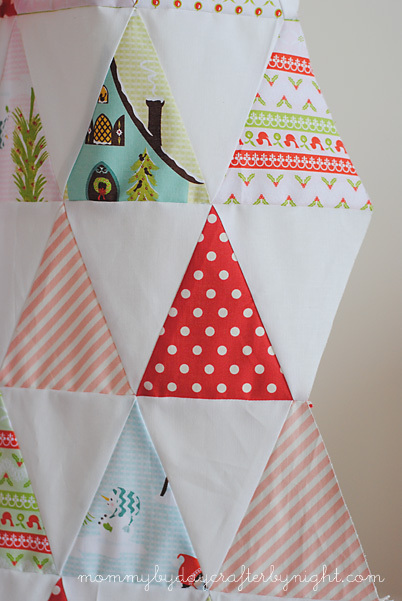 Once your triangles are all cut out, you can lay them out in the pattern that you would like. Once you have your quilt top all laid out how you would like, gather up the fabric and keep separated into piles for each row. I like to place labeled post-it notes in between my piles of each row to keep them separated. Now you are ready to start piecing. For piecing, I used a couple of extra triangles and kinda played around with sewing them together to get the hang of sewing with isosceles triangles. It's not tricky- just different than what I am used to. 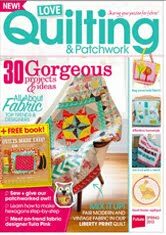 So if you are nervous to do it- try it out with some extras and get a feel for it before you start your quilt top. 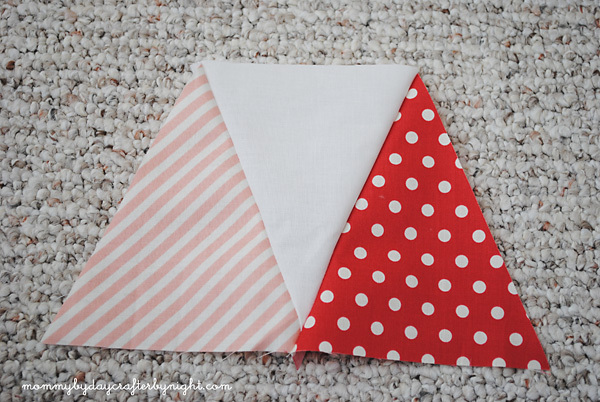 Lay your triangles right sides together and offset them by 1/4 inch (just like when sewing bias binding together) and then sew together with scant 1/4 inch seam. When you open them up, they should look like this. Next add another triangle. Stagger by 1/4 (you can tell when it is lined up perfectly because the top points of the triangles will match up.) and then sew with scant 1/4 inch seam. Open up, add each triangle once at a time until you have a row complete. Then move onto the next row. -One thing to think about as you are piecing is that you will need to nest seams to make sure that things line up and go together well. 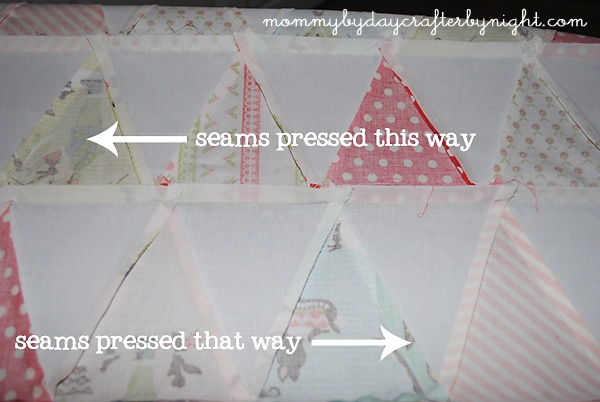 So as you are sewing row one, have the seam allowance point towards the left each time you add another triangle. Then with row two, have the seam allowance pointed towards the right as you add each triangle and so forth with each row so that when it comes time to press the seams, they will already have a tendency to go in the direction that you are wanting them to. Once all of your rows are pieced, press each row and the seam allowances in the direction that they need to go. This is where the spray starch comes in! The starch helps to keep those seams allowances behaving while you do your pinning and sewing. Now you are ready to start sewing your rows together. Pin a row #1 right sides together with row #2. 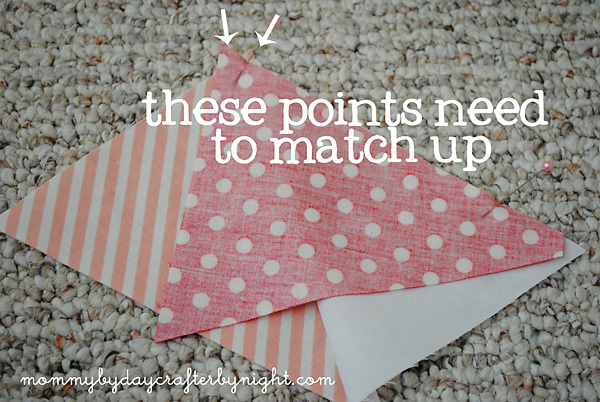 Make sure that when you are pinning that your triangles are going in the correct direction. With the seam allowances going in opposite directions the seams should nest together nicely and you will be able to line up the triangles nice and neat. 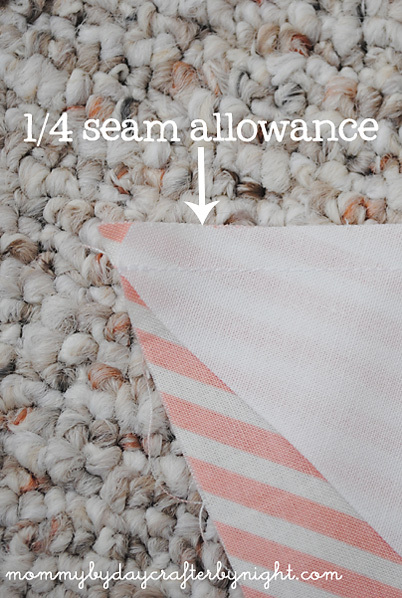 Once your row is pinned, sew together with the same seam allowance. Add row by row until you have your entire quilt top completed. Now use the spray starch and press the newly sewn seams... I did not press them open, I pressed them all in one direction. 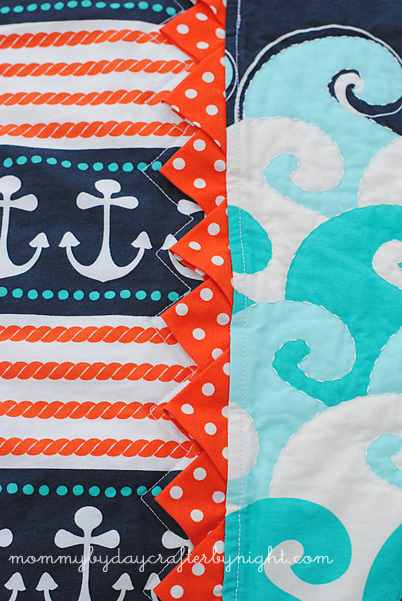 The edge of your quilt should be a nice and zig-zagged now. 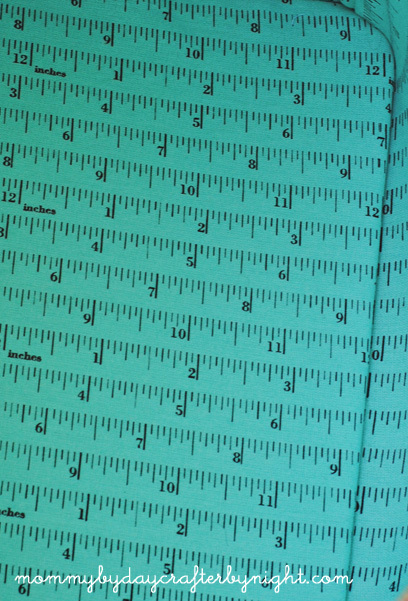 Measure your top and find out how much yardage you will need for your backing and how much backing you will need as well. Step #3: Piecing your quilt back. For mine I ended up using 4 yards of fabric even though I could have gotten away with 3 1/2. The reason being that I wanted the pattern on my backing to run up and down as opposed to side to side. So even though I had a lot of extra that I had to cut off on the sides, I was ok with that so that my fabric pattern went up and down instead of side to side. 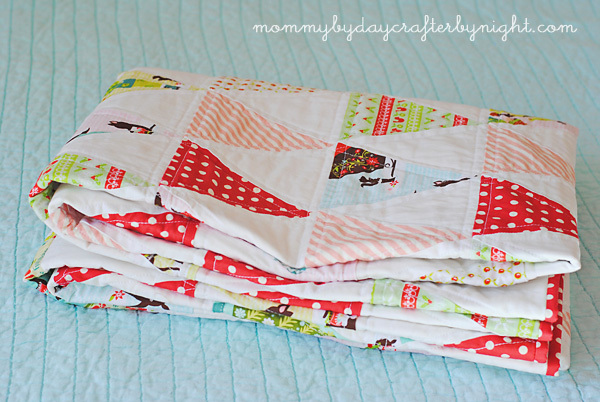 Once you have your quilt sandwich then you are ready to start quilting. Like I mentioned in my first post, I used my walking foot and straight line quilted along each seam. Once you are done quilting, you can either square off your quilt top and cut the zig-zagged edges off or leave them be like I did for mine. Now you are ready for binding. 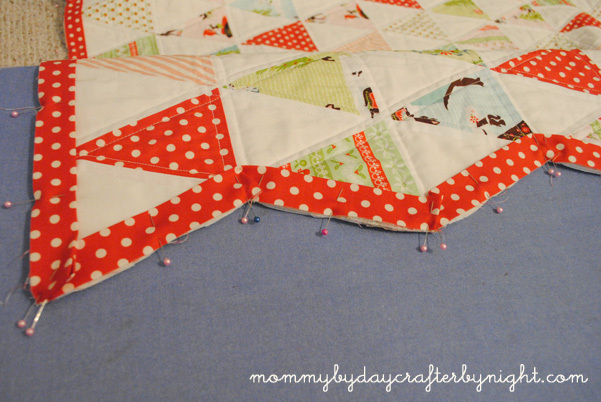 I did not use bias binding for my quilt, but if you are doing the zig zag edge like I did I would recommend doing bias binding for yours so it bends and moves around the points nicely. 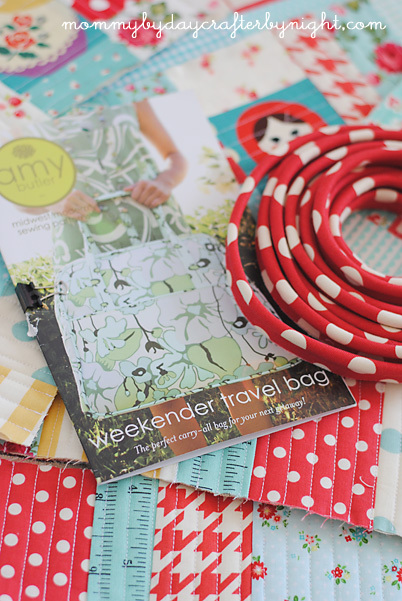 Here is a great tutorial on how to make and use bias binding. Once I had my binding made and pressed, I pinned and sewed it to my quilt front and then hand stitched it to the back of my quilt. I just worked the binding in place on the back and treated each point as a corner and finished off the points just like I usually do on the corners of my quilts. It took a lot more time that regular straight edge binding, but I feel like the end result was very worth the extra time. I love how it turned out! Well there you have it! 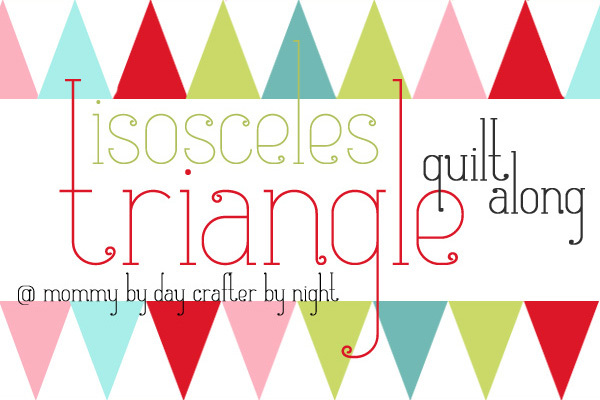 Your very own isosceles triangle quilt! 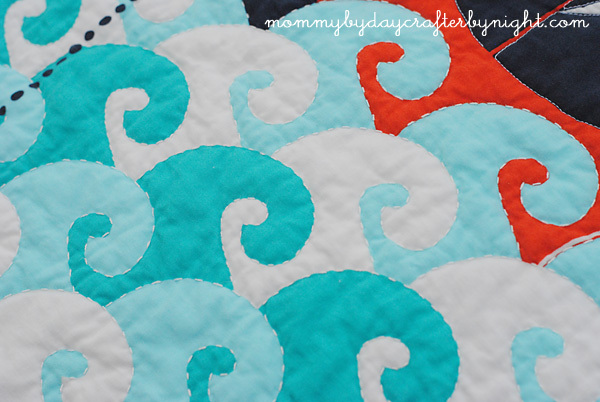 Thanks for quilting along! 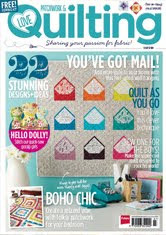 Be sure to email me a picture and link of your finished quilt when you are all done! Maybe if we get enough I can do a round up post of all your quilts! Also- let me know if you have any questions- just leave a comment and be sure to leave your email so I can get back to you. 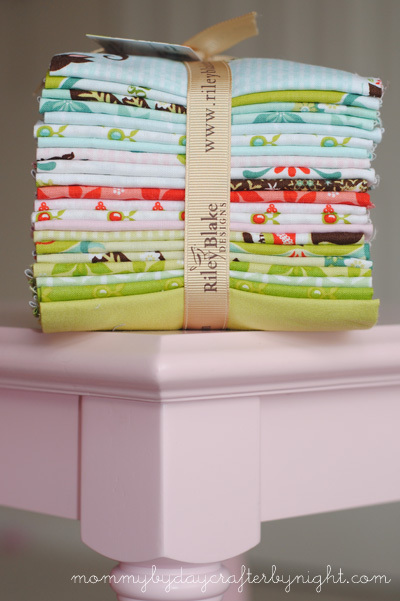 Last but not least, I just wanted to give a big shout out to my sponsor for the quilt along- Riley Blake Designs. 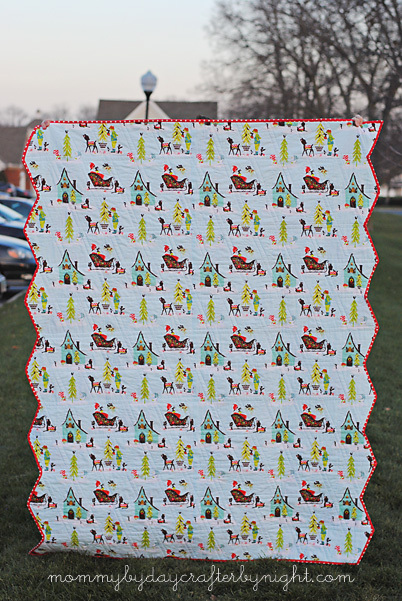 Since I started quilting, I have been wanting to make a Christmas quilt to snuggle with during the Christmas season. I finally checked it off my to-do list and this lovely quilt has found it's home on my couch next to the Christmas tree... I am loving it! It's the perfect size for my littles to snuggle with and maneuver around, but it is big enough for an adult to use as well. 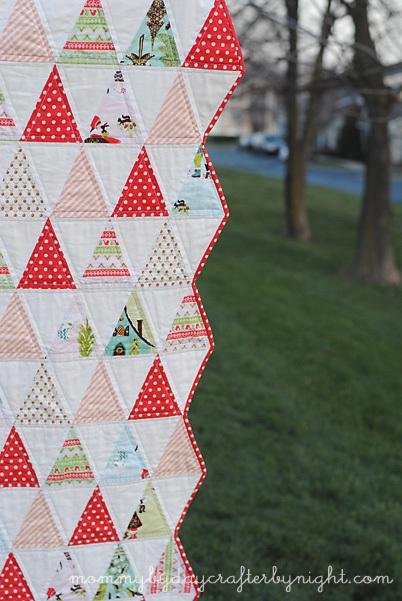 I fell in love with and was totally inspired by Amy's Kitschy Christmas quilt. 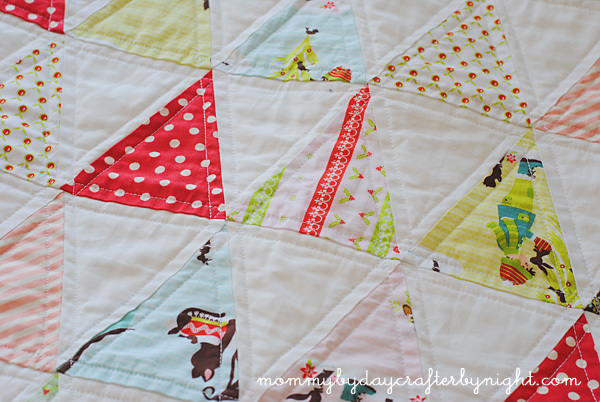 I love how vintage and retro her quilt is! 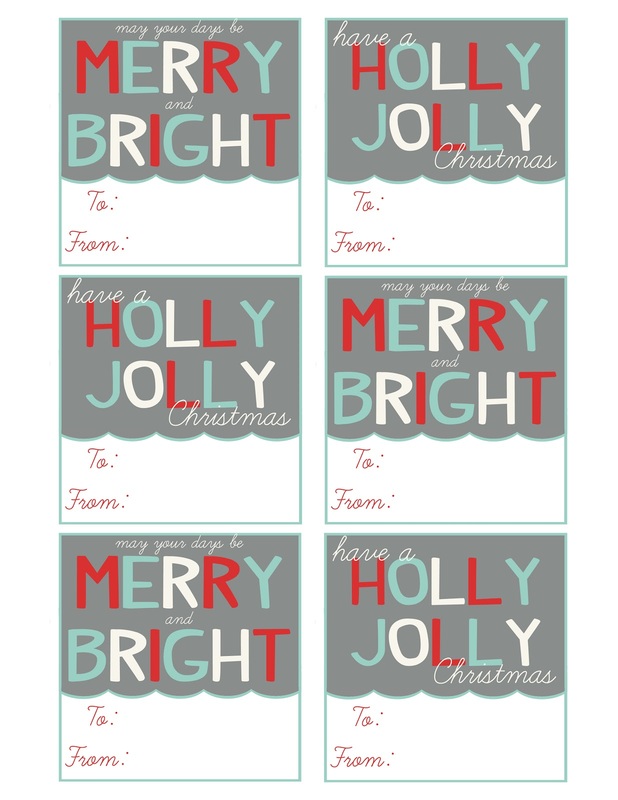 I may have to make another next year and go for more of a retro feel. 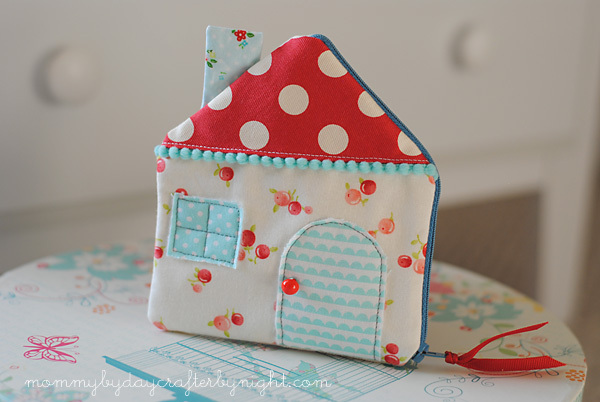 I made mine using Riley Blake fabrics... I used two different lines... The majority is from Alpine Wonderland line and I also threw in two prints from the Marguerite line (red polka dot and the pink stripe). 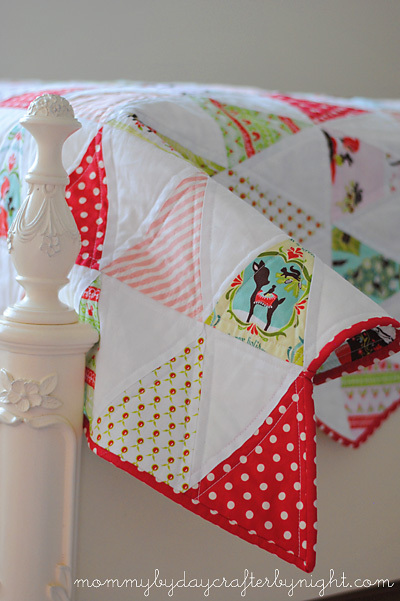 I wanted to go for a slightly girly feel to this quilt since I have two little girls... And I love that if I really wanted to I could use it if I want during the year since it is not totally Christmas-y looking. Instead of trimming off the excess from the triangles and squaring off my quilt, I decided to try something new and left the zig zag edge. I love how it turned out! Just something different. I used the Alpine Wonderland Main in blue for my backing and love how it turned out. The print is so big and fun. I took care to piece it together carefully so as not to see the seam in the backing and it turned out great. I contemplated hand quilting this one... and honestly I think it would have turned out really awesome if I had done that, but in the end, I opted to finish this quilt before Christmas instead of after and machine quilted 1/4 inch from every seam. I think it turned out pretty good. I love the straight lines and the design on the back looks really cool. 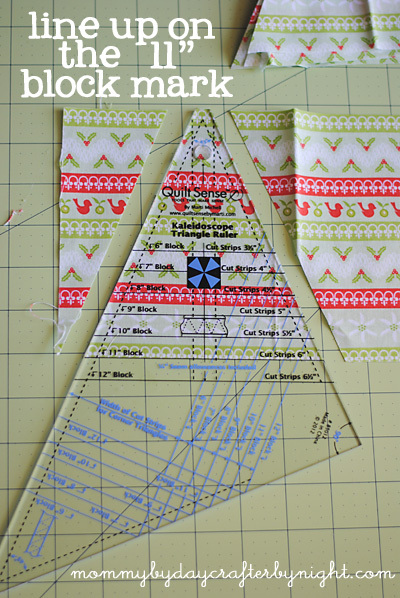 -For cutting my fabric into triangles, I used the Quilt Sense Kaleidoscope Triangle Ruler. I picked mine up at Joann's and was able to use a coupon to get it for pretty inexpensive. It is super easy to use- I just cut my fabric into 6 inch strips and then lined up the template on the 11" block line to cut my triangles... They are 45 degree triangles that measured 6" tall and 5 1/4 " on the base of the triangle- so if you wanted to make your own template than that would probably work ok too. -instead of giving you specific yardage, I am going to let you know how I made mine and give you some options. 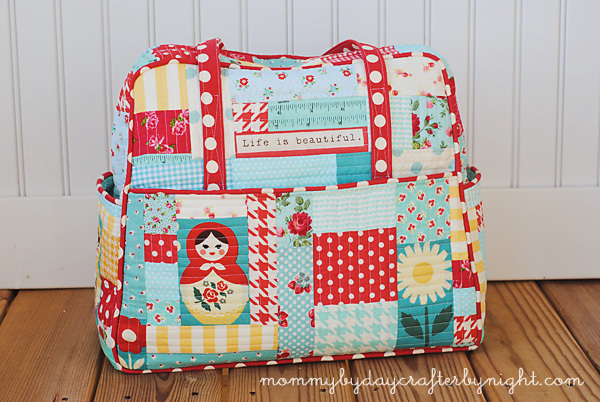 You can make this quilt with scraps, fat quarters, 1/4 yards, 1/2 yards, etc. The options are endless. 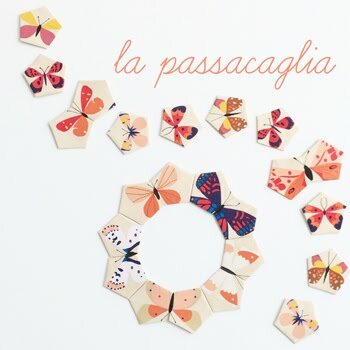 I started with an Alpine Wonderland Fat Quarter bundle, and then added some yardage of the red polka dot and pink striped Marguerite fabric to compile my 156 prints/colored triangles. 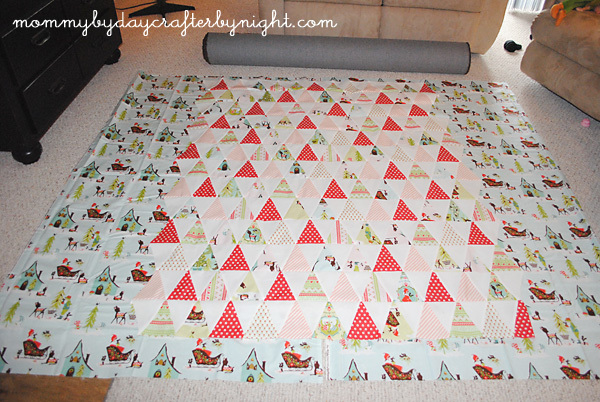 Then I used 2 yards of Riley Blake Clean White yardage for the 156 white triangles. Ok... Like I said, I used a fat quarter bundle and some various yardage for my quilt top, so I will just let you know how many triangles you can get out of different cuts of fabric and then you can decide what cuts you want to use. Just something to think about- After I had my quilt all finished, I realized that since I used an even number of triangles across the quilt, I ended up with a kinda funky shape of quilt. Meaning- on the top left of the quilt there is a white triangle so it zags out but then on the top right of the quilt there is a colored triangle so it zags in. It's no big deal, but makes it kinda tricky when folding it since the top corners are not symmetrical. 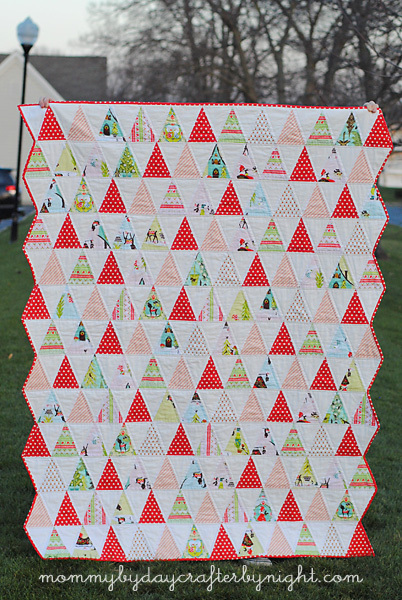 So if I were to make it again, I would probably do my quilt 25 triangles wide instead of 24 so that it was symmetrical. I am just kinda weird like that though, so if that doesn't bug you then go ahead and do 24 triangles wide like I did. 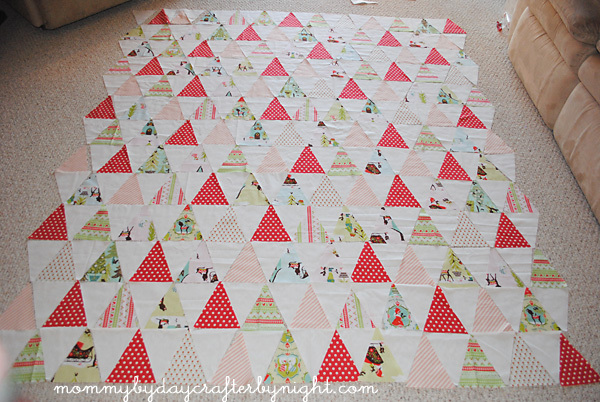 Like I said, if you are following my layout, you will need 156 colored triangles so calculate how much yardage you will need depending on if you are using fat quarters vs. 1/2 yard cuts, etc. Then you will need 2 yards of a solid/neutral fabric. If you are wanting to make your quilt smaller or bigger than mine, just figure out how many triangles you want and calculate how much fabric you need to buy. -1/2 yard to 3/4 yard for binding... just depending on if you decided to do the zig zag edge like I did or square your edge and do straight edge binding. 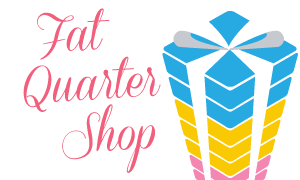 As for the batting and backing since my seam allowances were messed up when piecing my top, I recommend finishing your quilt top and then purchasing those two items after you have a final measurement so that you are not buying too much or too little. 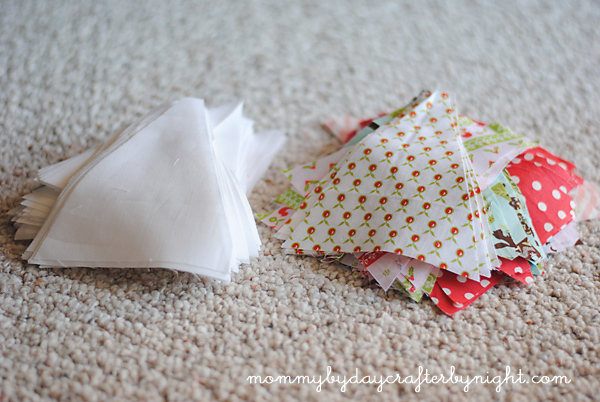 I will be posting the directions for cutting your fabric and piecing your quilt top next week so stay tuned! 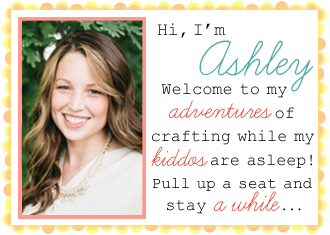 If you have any questions, leave a comment but be sure to include your email so I can get back to you! 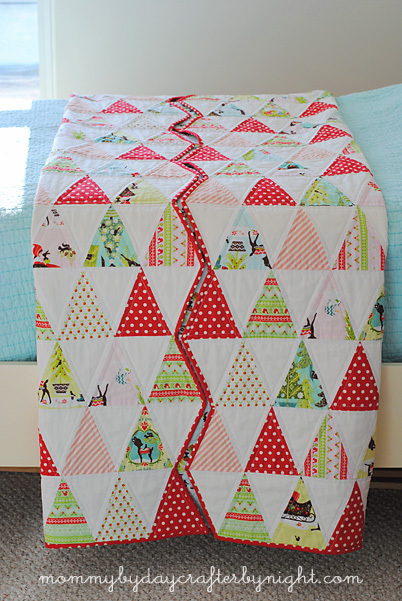 For directions to make this quilt, click HERE. I finished my Quilted Weekender Bag!!! I love the way it turned out. I took it on it's maiden voyage last weekend to Nashville. I always try to be a light packer and only bring the bare necessities- so it was the perfect size to fit my clothes and makeup in... But the blow dryer and flat iron had to squeeze into my kiddos bag. 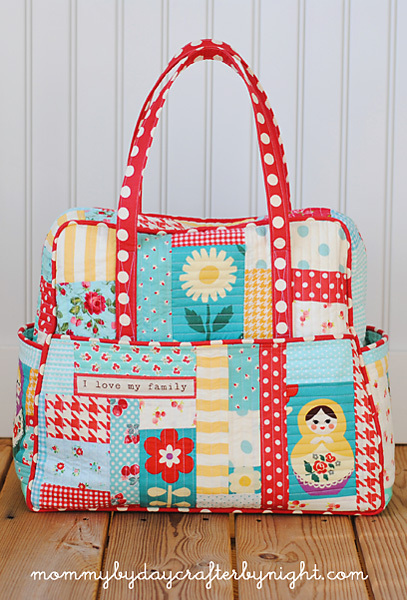 My inspiration for the bag was this quilted patchwork Weekender Bag by Elizabeth of Oh, Fransson. 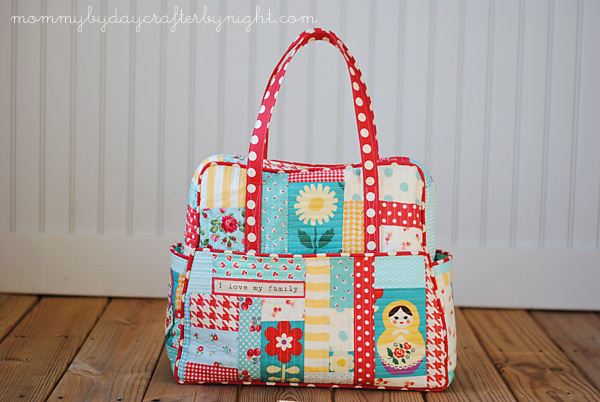 I loved this project because I was able to incorporate all of my favorite fabrics and scraps into one bag. It has all my favorite colors, patterns, etc so it is totally me. I used a bunch of leftovers from my scrap pile of fabric so I am not sure of the names of all of the fabrics, but the majority of them are from these fabric lines: Vintage Modern, The Simple Life, Annie's Farm Stand, Ruby, and used this Kokka Matryoska Fabric and fussy cut out the flowers and matryoska dolls as accents in the panels. I also fussy cut the sayings "Life is Beautiful" and "I love my family" from the Odds and Ends Happy Thoughts in Rosebud fabric. I used Oh Deer! Twill Cherry Dot fabric for the handles and piping. For the lining, I used Moda Made with Love Measuring Tape in Aqua Canvas. I made a few alterations in the pattern when I was making my bag. 1. I did not use all of the Peltex and interfacing that the pattern called for. Instead I used Elizabeth's method for quilting as you go by layering duck cloth and a thin layer of batting and then quilting my scraps onto that. In the end, My panels were very stiff and held their form without the extra layer of Peltex and interfacing. I did however follow the directions for the base of the bag and did use the interfacing and Peltex for that part. My bag stands up all on it's own and in all of these pictures, nothing is in my bag to hold it's form... 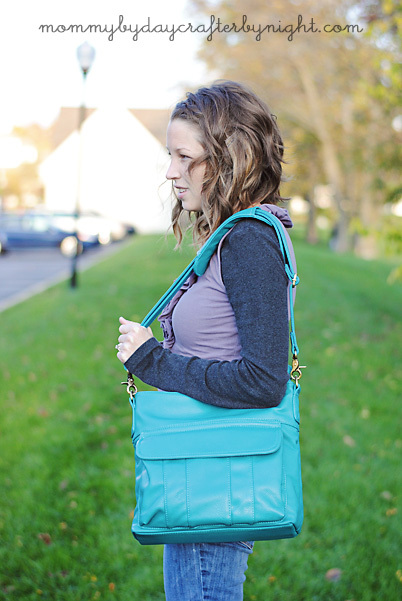 It's one of the things I love most about the bag- it's sturdy! 2. The Handles: I made them 8 inches longer than the pattern called for (if I ever make this bag again, I will make them even longer). When I sewed the handles onto the bag, I made an X in between the 9 and 13 inch marks. I also sewed the handles to the panel all the way down underneath the X's so that the handles weren't loose in the pocket. 3. The Outer bottom panel: I made my bottom panel out of oil cloth so that I could wipe it off easily in case I sat it on something dirty. Love this! I don't worry so much about my bag getting filthy on the bottom. 4. The Piping: When I made my piping, I did not sew it like the pattern called for. Instead I used 1/4 inch Steam a Seam tape and then when it came time to attach the piping to the bag, I didn't have to worry about covering up any lines of stitching. 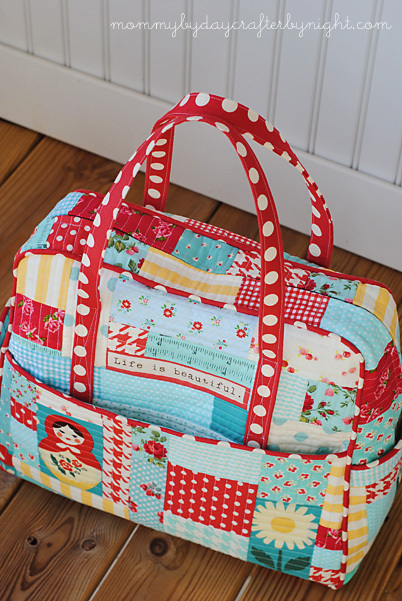 A couple weeks ago, I came across a quilted patchwork Weekender Bag by Elizabeth of Oh, Fransson! I fell in love with it the minute I saw it and knew that I needed to finally take the plunge and make the notorious Weekender Bag by Amy Butler. This bag is kinda the Holy Grail of bags and definitely has a reputation for being hard to get along with due to all of the layers of peltex, interfacing, cording, etc that are involved when making it. 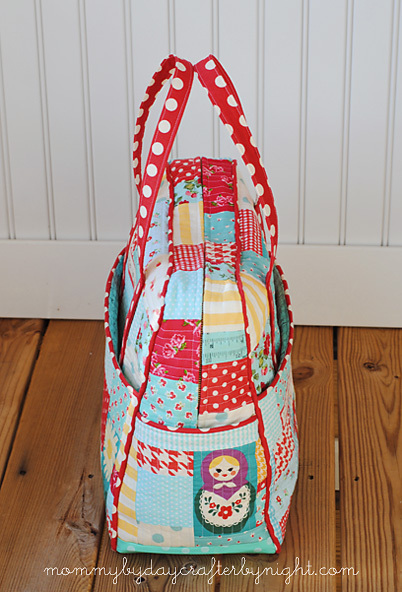 I have always loved the look of this bag, but the reputation and horror stories had me pretty much sworn off making it, but when I saw Elizabeth's bag and the method that she used to make it by quilting as you go onto cotton duck cloth, I had a change of heart. 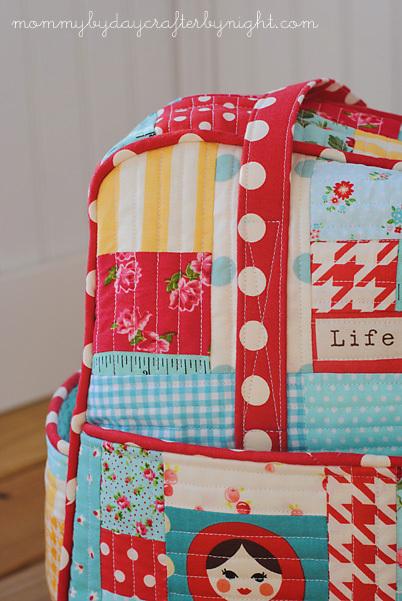 Apparently I am not the only one either- from what I have heard of Sewing Summit and seen on a few blogs, it looks like Elizabeth sparked a quilted weekender craze and there is now a quilted weekender bandwagon! Check out these fabulous bags by Laura and Amber! 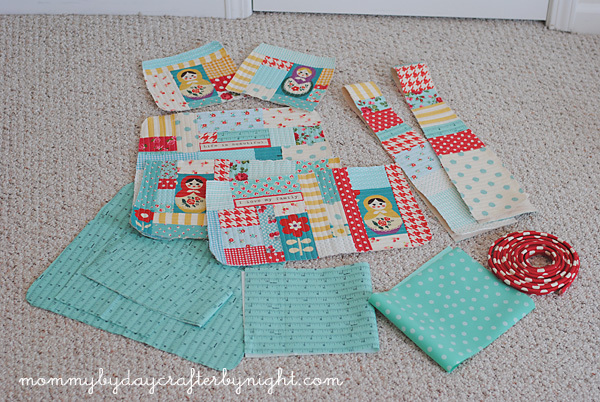 Two weeks ago, I raided my scrap stash and even dug into a few fabric piles that I had been saving for a rainy day and came up with my color palette- red, aqua, and yellow. It hasn't been a fast process by any means, I just add a little each night and am finally finished creating my patchwork panels so now I am ready to start assembling my bag now...Duh, duh, duh... I am hoping to make it out in one piece! Wish me luck! 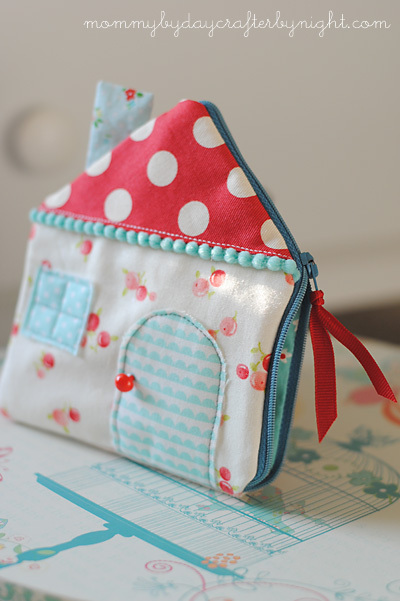 Here is a sneak peak of what the the main and pocket panel are looking like together! I am excited to see it finished! Stay tuned for more pictures to come soon once I finish it! For the longest time, I have been looking for the perfect solution to my "ugly camera bag" problem. Don't get me wrong, my "ugly camera bag" is nice and has it's own time and season for uses when I need to cart along all of my lenses/gear, but on a whole, I am usually just grabbing my camera with the lens on it and throwing it in a bag and running out the door... or... gasp... leaving the camera home because my purse feels too bulky with it in there. I know- terrible right? But with my fresh perspective on recording our family memories, leaving the camera behind is no longer an option. While I was at SNAP, I noticed one thing that just about every blogger had- and I didn't... a darling Jo Totes camera bag. 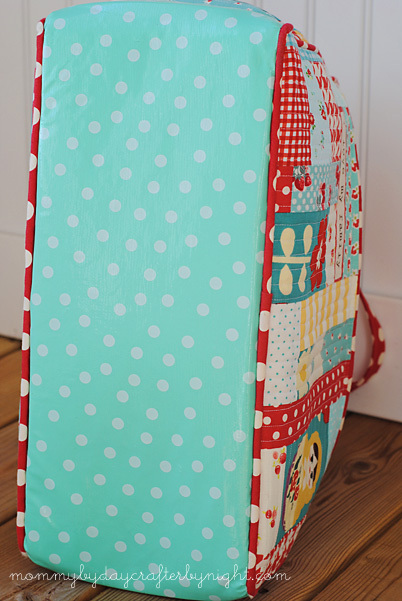 I have always wanted one, but after that conference and seeing how versatile each and every Jo Totes bag is... I knew I needed one! The thing I love most about them is that they are not just for carrying your camera. There is a spot for an iPad, a wallet, a phone, an extra lens, and any extra things you need on hand! I saw one lady that had one of the larger Jo Totes bags and I felt like I was watching Mary Poppins pulling things out of her carpet bag as I saw the things she was taking out of this bag. Who knew you could fit all of that in, with your camera and still have it safe and padded! I was impressed to say the least! April from Jo Totes was so nice to send me my own camera bag to see how I liked it. And to be honest, I have taken it everywhere since. It has been so nice not having to worry about my camera being safe in my bag or forgetting my camera as I ran out the door. I picked out such a fun bag. It is their newest bag available called the Allison Bag. With my love of anything mustard yellow, I was of course drawn to the mustard version... but, just to throw myself for a loop, I went with the teal to change it up a little. I am so glad I did. I love the color of it. It looks even better in real life that it does in the pictures. 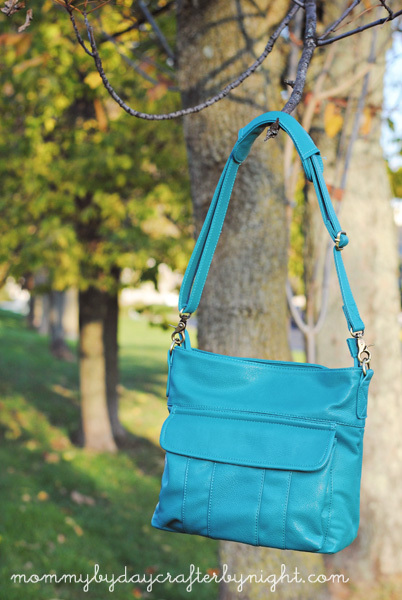 I love the Allison bag because it is one of the smaller bags. I just wanted something that would fit the bare necessities and not be too heavy once I got it loaded. It has been so perfect for my needs! I wouldn't change a thing about it. I love that it doesn't look like a camera bag. I love that it has a zipper at the top and no flap covering it- easy access to my camera. I love the magnetic clasp pocket on the front to put my keys and phone in. But most of all, I love the adjustable velcro pads on the inside of the bag so I can adjust where my camera fits in and keep it nice and protected but also fit other things if needed too. ...but of course the Allison won me over. I had a tough time choosing between all three bags since they are each so cute and different. Just when I think they can't come out with a cuter bag, they do, so I love to follow along with their Facebook page to keep up to date with new arrivals and all of the giveaways that they have. With me having little girls, it's pretty rare to see me sewing for a little boy... but one of my friends just had her very first baby boy last week and I couldn't resist making the new little guy a quilt. 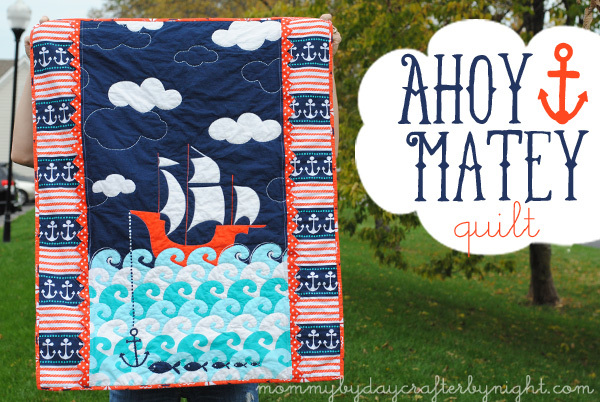 I can't even tell you how much I love this Ahoy Matey fabric by Michael Miller . 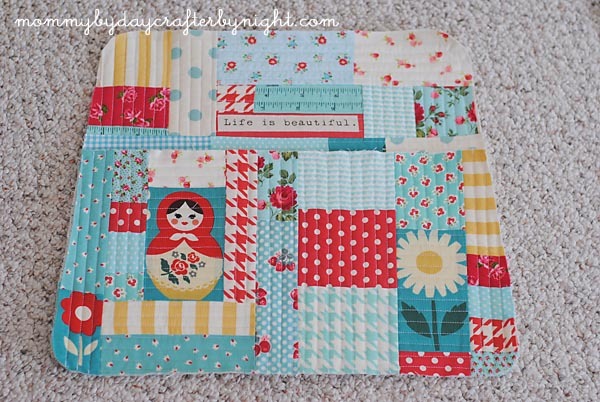 When I saw that it had a panel and that it was so darling, I knew that I wanted to try making a quilt using a panel. Usually I am not a huge fan of panel quilts, but this one may have changed my mind. 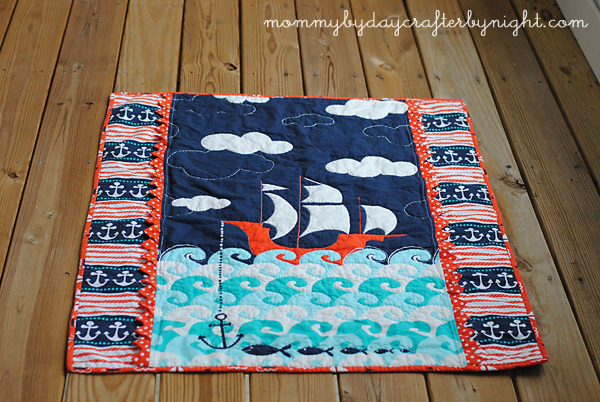 To make it, I used one panel (which is the main part of the quilt with the ship and waves on it), and then I used the Navy Stay the Course fabric for the side sashing, and Dumb Dot in Clementine for the prairie points, Clementine Ship Shape for the binding, and then Quarter Dot in Midnight for the backing. I have been wanting to try doing prairie points on a quilt and I felt like this was the perfect quilt for it. I found an awesome tutorial for continuous prairie points on Sew Take a Hike. It was such an easy tutorial to follow! Love how they turned out!